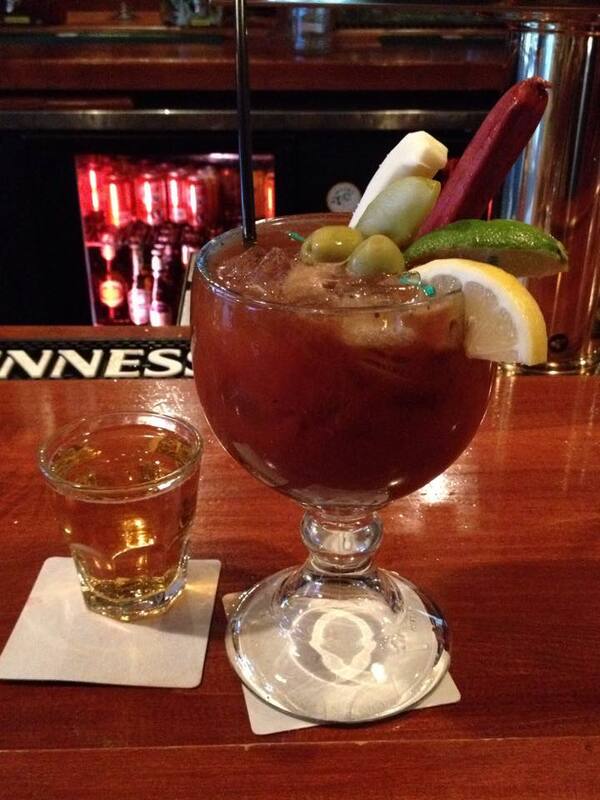 Take Three Tuesday: The Best Bloody Mary in Racine/Kenosha is…. December 16, 2014 – THREE FOR TUESDAY – Last week, we asked our members to share their thoughts on the best local Bloody Mary. After much research and yes, a designated driver, we have compiled our results for our top three. 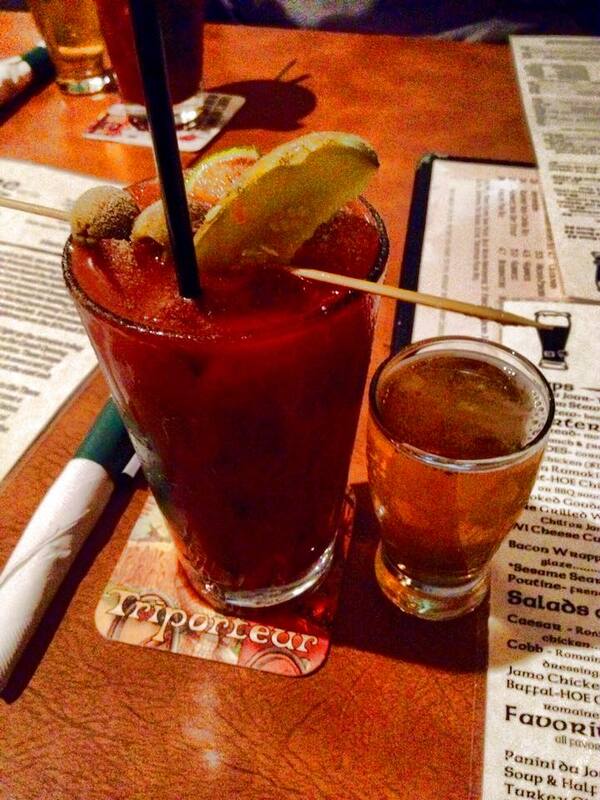 Of note, when our order was taken, we simply ordered a “Bloody Mary” – no special requests were made. When asked for a heat level, we always went with “medium”. This was a good, standard Bloody Mary made with Worcestershire, a few splashes of pickle juice, vodka, Tabasco and V8. The glass was rimmed with celery salt which was a nice touch. The drink was garnished green olives and pickled asparagus (another nice touch). This was definitely the spiciest of all the Bloody Marys sampled – we weren’t asked for a heat level. A beer back was included with our drink, and we got to choose from their tappers. We went with Spotted Cow. 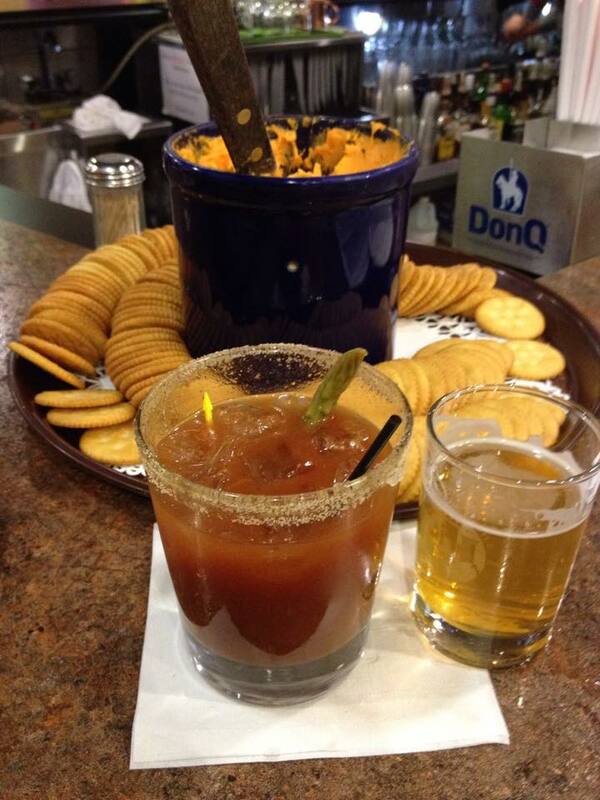 The cheese and crackers available at the bar was also appreciated . We really liked the Bloody Mary at Ashling. It included the usual Worcestershire, celery salt and vodka. Their Bloody mix was in a plastic tumbler, not from a can. We were asked if we’d like it hot, medium or mild – we went with medium, and it was spot on. Being an Irish pub, they topped their Bloody with a little Guinness as well. We LOVED their garnishes – a lemon and lime wedge, a pickle, green olives, a pepperoni stick (yummy) and string cheese. We weren’t offered a choice of a beer back; Harps was given to us. I was ok with that though. I chalked it up to a very large group of people arriving at the bar right before we got there. Since there was only one bartender, he was incredibly busy. Overall, I would go back for this drink, and Ashling on the Lough definitely gets the best garnish award. Full disclosure here – I did not get to see this Bloody Mary being made because we were sitting at a booth, not the bar. However, when our drink order was taken, we were asked if we wanted mild, medium or spicy (I hope others take note of this because IMO, an overly spicy Bloody ruins it for me). We were also asked for our preference of a beer back. We went with Spotted Cow. The drinks were garnished with a pickle and green olives and topped with celery salt. Now, I really like a variety of garnishes, so admittedly, I was a tad bummed at first sight, but then I took a sip…. YUM! Seriously, this is a tasty, tasty Bloody Mary with some pretty complex flavors. When we asked about the Bloody mix, we were told that the secret is their infused vodka made specifically for their Bloody Mary’s. That’s right – they soak carrots, celery, garlic, cooked bacon (that’s right, BACON) and various other ingredients (I’m leaving out some things because it’s their recipe, not mine) with 7 or 8 bottles of vodka to get that delicious flavor. While I’m hoping that Ivanhoe will choose to up their garnish game a bit in the future, taste-wise, this was hands down the best Bloody Mary. We will, without a doubt, be back for this drink (and the Poutine). Nicely done, Ivanhoe. Nicely done.